Hi, friends! I hope you’re all having a great week. The past few weeks have finally started feeling like spring in Boston, just in time for the tenth annual BlogPaws® Conference! This year, the conference was in Kansas City, Missouri and I really feel it was the best one yet! If you don’t know what BlogPaws is yet, let me tell you! BlogPaws is a global community of pet bloggers, influencers, and social media enthusiasts who have come together to help educate, promote, and support one another. I joined the BlogPaws community in 2015 and since then, have made a ton of connections, made new friends, and learned so much about blogging and how to be a better influencer. This year, Chewy® chose me to be one of their sponsored bloggers, which made the trip extra special for me! At this year’s conference, I sat in on a few presentations that focused specifically on social media. I was thrilled to learn more from @ipartywithbrucewayne about how to use Instagram stories to help increase engagement, something we have only recently started using and definitely need to up my game on. I also really enjoyed hearing from @tmistick (Dog Mom Blogger) about how she uses a color scheme to brand her accounts. You might have noticed a slight change in the color scheme of our blog this week–I’ve been really taking Tori’s advice to heart! I’m excited to expand that idea to the rest of our accounts as well. Finally, I think my favorite speaker might have been Marika Meeks, who runs @incredibullstella‘s account. Her advice to bloggers? Be true to yourself. Be authentic. It made me remember why I enjoy blogging so much–I love being able to share stories about the boys and give you a peek into their lives. It’s kind of crazy to think that so many of you actually want to read about their day and get to know each of their personalities. 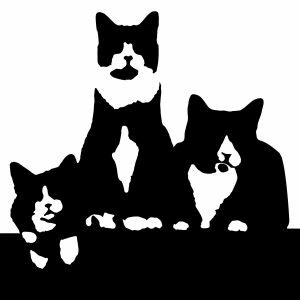 After all, we are just a regular home to a trio of tuxedo cats! Writing has always brought me joy and I can honestly say that my life has changed for the better by sharing my sweet little tuxies with all of you. I can’t tell you the number of friends I have made from being a part of this blogging and influencer community. In fact, the friend I travel with to BlogPaws each year is someone I met through Instagram and never would have known her otherwise had we not connected with one another on social media! First up: the SWAG BAG! All attendees to the conference receive a giant tote bag filled with incredible goodies for you to bring home to your pets. You also get to meet a ton of brands that have come to the conference just to meet you and tell you about their products! This is a great way to learn about new brands and hear about all the incredible ways these companies are giving back to the pet community. Oh, and don’t forget all the furry friends! Many people bring their pets to BlogPaws, which can often be quite a distraction from everything else. It’s hard not to stop and pet each little smiling face! Long story short: If you’re a pet blogger, influencer, or even just someone who loves posting photos of pets, you should seriously consider joining our community and maybe think about joining in on the festivities next year! We had a blast and can’t wait for the next event. A special thanks goes to Chewy for sponsoring me this year! If you don’t already use Chewy.com for all your pet needs, please take a look at their website! They have over 18,000 items in stock and ready to ship to your home at lightning-fast speeds! We are big fans, and even Hugo will tell you that they have the BEST boxes to play in! This is a sponsored conversation written by me on behalf of Chewy. The opinions and text are all mine. Previous Post Check out these new Jackson Galaxy™ cat toys – and a giveaway!